One of the hardest parts to running a blog is getting people to your blog; aside from making it interesting, and of value to your readers. This is why keyword research should never be overlooked when creating a blog. However, keyword research can take a long time to complete, and isn’t really a fun and exciting part to operating a blog. I want to introduce Market Samurai to you, as I have been using it for a couple months with excellent results. Market Samurai has a number of valuable tools such as, site placement tracking (rank tracker), seo competition, monetization, and even allows you to find content, in which you can rewrite in your own words or get backlinks from. Really an affiliate marketers, or professional bloggers dream. However, in this article I want to talk about how Market Samurai makes it easy for me to find keywords that people search for, and more importantly will gauge how easy they are to rank for. I know if you are going to invest your time and effort into a website or blog you want to make sure you are not wasting your time. Market Samurai really does take the guesswork out of the equation, though. I am not really the kind of person that goes out and buys all kinds of software, but rather invest my money in link building, content creation, etc. but this application was really worth my money. A lot of people know how to do keyword research and really know how valuable it is to making money online. However, if you are like most people, you either procrastinate doing your research or just outsource other people to do it for you. Believe me I did both of those the past couple years and I am very fortunate that I discovered Market Samurai when I did. For instance, I am very good at SEO, but keyword research is just way to time consuming for me, that was until I discovered Market Samurai (which Tom Sinfield who runs Standoutblogger.com) showed me one day. Wow, this saved me a lot of time! And it is painfully easy to use as well. All you need to do for the keyword research tool is type in keywords you want to rank for, or even make them broad and MS will suggest some keywords for you, as well. You can filter them the way you want, too. For instance, if you want keywords that have 100 hits a day you can easily specify that. You can sort your results by a variety of different categories which include total searches (broad, exact, and phrase), SEO traffic, which is the number of estimated hits you will receive at the number one spot on Google, Google trends, Adwords traffic (a variety of different ways of analyzing it), I don’t use Adwords but if you are PPC guru can help you a lot, optimized keyword results, and how many sites use the keywords in their title. There are a plethora of ways to sort your data, as well. For me, I do a lot of SEO work for other people so I can easily save my settings for each site. Saves you hours of time! Not to mention I use the “rank tracker” to see how well I am doing, and I am in fact going up in the search engines. I know of a lot of people that use Wordtracker Professional and I believe that software cost several hundred dollars. Another great feature I love about Market Samurai is you can find other relevant Squidoo lens, Wiki’s, Hubs, etc. and leave quality comments, and either build up your social properties or the website or blog you are working on. Also, it really helps a lot with content creation as you can type in some keywords and get tons of articles from various sources to read. Just pick out interesting content and have it rewritten in your own words, and you can start making a massive amount of income from this tool on MS.
Really, there is no one way to run Market Samurai; you just have to use it the way you want. If you want to go for insanely hard keywords then MS will tell you, but if you are like me you don’t want to have to put so much effort forth in order to rank in Google. Its kind of similar to Micro Niche Finder, but has a lot more features. What really makes this great is it does all your research for you. You can go take a shower, go to the bar, eat dinner, or whatever and in a couple minutes your research will be done for you. You can then export it to an Excel spreadsheet and decide which keywords you would like to target and eventually go for in Google. Believe me all that research could take you hours to do, however can be done in a matter of minutes with Market Samurai. What I typically do is go for keywords that get 1,000 searches a month and have under 5,000 in title keywords. Those should be pretty easy to rank for and a handful of authority backlinks to a property optimized page, will get me ranked in no time at all. Bare in mind, I do go for keywords that are harder than that, but I have a piece of mind because I know I am going to have to work harder in order to get ranked for those keywords in the SERPS. Web CEO is a software package of ten main tools that help you to promote your site in search engines, analyze your visitors, and easily maintain your Website(s) at optimal quality.
. Head over to www.webceo.com and buy it. Don’t say I don’t give you good advice! If you’re still not sure, read on and I’ll give you the lowdown on a piece of software that, if I was smart enough, I’d have purchased years ago — and saved myself thousands of dollars and thousands of hours. So, you’ve decided to read on? Okay, I’ll start at the start. Keyword research tool: find the right keywords for your site. Search engine optimization tool: compare your Website optimization readiness against the top ranked sites. Simple editor: access, view and edit the various parts of your HTML page. Search engine submission tool: automatically (or manually) submit your site to the search engines. Contains notes on each individual search engine with space for your own specific comments. Check your rankings: a huge timesaver for search engine specialists and Website owners who need relevant data. Link checker: quickly and easily check who’s linking to you, who’s linked to your competitors, and much more. Website quality assurance: comprehensive review of all site components with detailed analytical reports. Quickly find and repair any damaged files or pages. FTP uploader: quickly upload files without leaving the software. Always know the status of your site: real time monitoring keeps tabs on your site even when you’re not there (and you can be emailed or telephoned the results). Comprehensive site reports: includes hundreds of detailed reports to enable you to make the right decision every time! Web CEO charges an ongoing fee for optional components of the software. This is and will continue to be the secret (aside from the brilliant software!) to their success. For example, HitLens (the traffic analysis component) is priced at 59 cents per 1,000 page views for “Power Reporting” or 79 cents per 1,000 page views for “eCommerce Reporting”. Site monitoring costs between $0 and 41.80 per day. Access to the downloadable Knowledge Base updates costs a little more. Now, many of us balk at ongoing fees like this. But, be realistic: the provision of the analysis and monitoring services, and keeping the knowledge fresh, takes time, money and significant resources. The guys at Web CEO aren’t about to compromise the success of the sites that use their product by scrimping to save the customer a few cents here and there. You want the best quality software with ongoing quality service? Of course there needs to be an ongoing fee. To ask for anything less would compromise the quality of the ongoing service, and very quickly diminish the value of the software to customers like you and I.
It’s a great strategy that’s of great benefit to the customer. …Sound Like Anyone You Know? Once upon a time there was a handsome man. Let’s call him Brendon. Brendon was handsome and charming… in equal parts! Brendon owned a few ecommerce businesses, and he also ran a busy little Web development firm that did quite a lot of search engine work. Brendon was going along very nicely and all was good in his world. “I’m so very clever, I surprise even my handsome self,” he would often be heard to say. “Here I am, making quite a bit of money from my Websites,” he said gaily one day. “Sure, it takes a while to manually check everything I need to check, and I’m not 100% sure of my search engine strategies, and I certainly won’t ever know what my competitors are doing — that would be far too difficult to figure out. And, although I’ve spent thousands of hours and dollars on my site management systems, I’m quite, quite sure no-one would have as much information on their site as I do! I’m so very clever… Let’s go find a mirror for me to look into….” And off he skipped. I confess: I’m “Brendon”. I’m not very handsome. And I’m certainly not charming. But most of all, I’m not smart. What I’ve seen Web CEO achieve means I’m pretty much a moron. If I was smart, I’d have purchased Web CEO as soon as I laid eyes on it. Why? Well, it’s time to get down to the nitty gritty and find out. In the wide field of search engine optimization,there had been lots of tools as well which paves the way in order to have effective search engine optimizing. In this case, there was lots of software that had been developed in order to aid the needs of those internet marketers whom are handling several SEO tasks. There had been lots of SEO software that had been mentioned in any articles that we can see online, however, there is only one which hailed as the best search engine optimization software that you can really use. Among those software that were being developed were the SEO Elite, Web CEO, Link-assistant, Trendmx, Traffic Travis and even with the Web Master Toolkit, and with all of these SEO tools it is the IBP or the Internet business promoter that you can rely most of your search engine optimization tasks. With the use of this Internet Business Promoter you can now have the chance of making all your tasks simpler. It has the ability of simplifying all your SEO processes and thus, this will also help your website gain the best page rank in the soonest time. Aside from these things, with IBP, you can also have those tested techniques that you can use in SEO and making a successful search engine optimization is already possible. Just like any other SEO software, this IBP is also riches with its reliable features however, it is somehow tested than those other software. If you wanted to harness the power of your website through the various SEO tasks, then you can make it possible with the help of the latest features that Internet Business Promoter is having. Keyword generator, keyword density analyzer, keyword editor, HTML validator, pay per click campaign manager, link popularity improver, manual ranking checker and the customizable SEO reports are among the features that you can full employ in the processes relevant with search engine optimization. With the utilization of IBP, you can expect to have an all-in-one pack of SEO tools which will help you a lot in order to succeed with your goal in doing the said processes. You can also be sure of the fact that you can have the chance of having a top ten rankings in the search engines. This is already a guarantee since you can have a money back guarantee as well if you cannot gain the said top 10 rankings. You can also make use of the user friendly search engine submitter which is one of the benefits that you can get from IBP. Thus, simplified process will be done out from doing those tedious submission processes. You can also have your own comprehensive IBP reports and data, which will provide you with the analysis of the various aspects which pertain to SEO processes. With all these reasons, there is no more doubt that you should make. 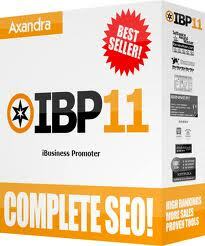 Make use of the IBP as your best SEO software now and became among the top internet marketer in your field.